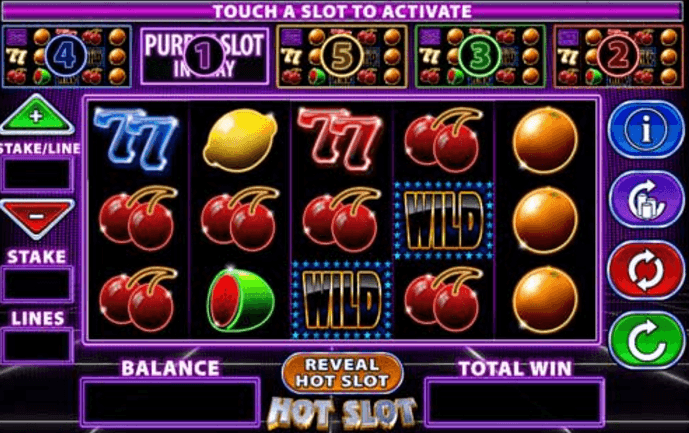 Hot Slot is a classic looking slot with a fruits theme, it has 5 reels on 3 rows and and 10 active play lines. It is a fun game with high entertainment value and some very unique features that you most likely won´t find anywhere else. The symbols in this game is perfectly fitted and designed and they more or less create the whole theme of the classic slot look. There is a few special symbols and features, the first being the Wild symbol. This is special in the way that it steps in and replaces all other symbols on the reels in order to help you create that perfect combination for the bigger wins. You can choose between 5 reel sets right above the main reels, or by pressing the “Reveal Hot Slot” button. This chosen Hot Slot will then remain hot until the countdown is at zero or when you choose the “Reveal Hot Slot” button again. The purpose of this is for you to choose which slot you think is the Hot Slot, and the correct one will then give you a 100% return! There is also the Big Bet feature, meaning that this is a game where you can get 5 linked spins of the reels. At the end all wins are accumulative and paid at every last spin. With every spin you make, you use all 10 paylines and the wins are paid accordingly.